Welcome to another installment of our loft vibes series!! 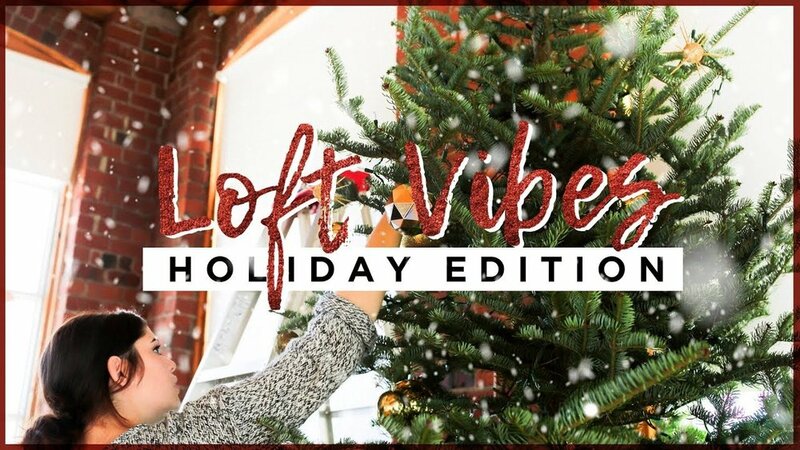 If you didn’t know, loft vibes is a series we do on our YouTube channel where we moved into and decorated the loft we work out of! This time we’re going full on holiday! We first started with the tree! We decided to DIY some glittery/star-inspired ornaments. To make these, just take a small foam ball and stick twelve toothpicks into each of the balls. Next, take some spray adhesive and use this to stick a ton of gold glitter onto the ornament! We finished off the tree by quickly whipping together a star out of wire, string, and a TON of glitter. We think it turned out super cute. Next we took our regular filming background and turned into a Christmas wonderland! We made little diy sweaters for our tools, added bows to everything, and laid out some garland and faux snow! Next we added these fabulous gold glitter twigs to turn our tropical plants a little more festive. Next we swapped out some of the photos on our photo wall to be a bit more Christmas-ey! Time to make the wreath! To make this wreath simply take various Christmas things (like some faux pine, antlers, pinecones) and wrap them onto a giant floral ring using some wire. We finished it off by adding a little bow to the top of the wreath! And that's it! The loft is ready for the holiday season! If you wanna see more fun check out the video below, if you make any of the DIYs in this Loft Vibes episode please show us using the hashtag #SorryGirlsSquad! I am SO excited to finally be bringing a house tour to you guys! I've been working hard moving in and decorating my new house, and now I can finally share it with the world! CAN WE DIY EXPENSIVE URBAN OUTFITTERS DECOR?! Today we are trying out a new little series on our channel playfully called "that cost how much?!" (shout out to our vlog viewers who get the joke!). This series is going to challenge us to try and make dupes of more expensive items. a dollar store outfit?! DOLLAR STORE CHALLENGE! Time for another dollar store challenge!! This time we didn’t really have a theme for the challenge, so our time at the store was kiiind of a free for all. Nonetheless, we think we came up with some pretty cool ideas for practically no money! Welcome to another installment of our loft vibes series! !